A new strike is set to hit British Airways this week, just as their initial 16-day job action was due to end on Monday morning. BA’s Mixed Fleet cabin crews have been on strike since July 1st, but the walkout was scheduled to end on Monday. However, The Unite union has vowed to launch a new two-week strike, beginning Wednesday July 19th, due to further pay disputes. If carried out, the cabin crews involved will have been on strike for 30 of the last 32 days. 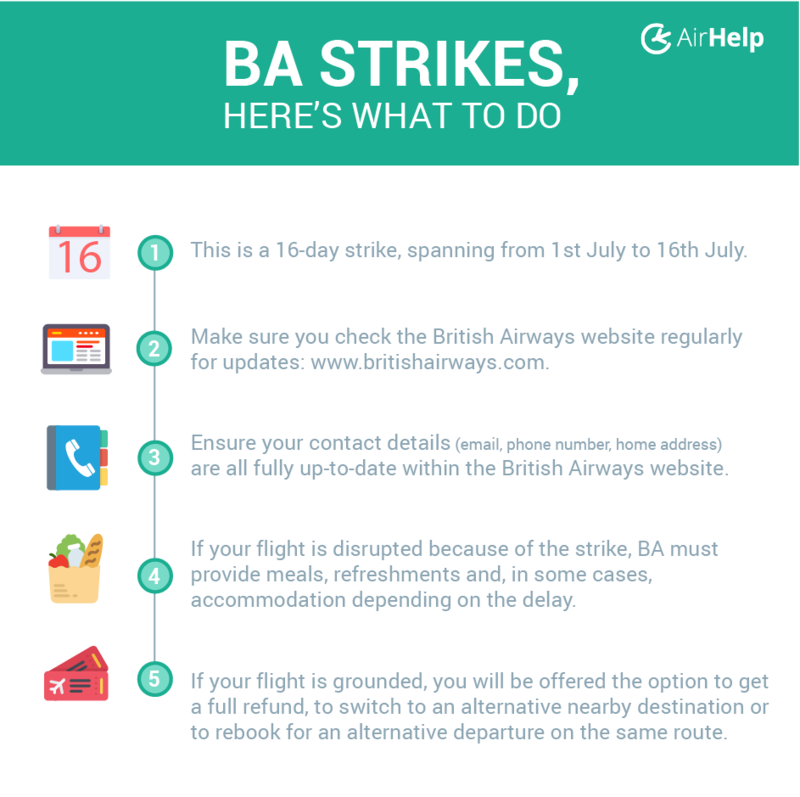 Have you experienced a disruption to your journey due to the BA strike? If you’re a passenger affected by the British Airways strike from July 1st to July 16th, you could be eligible for up to £530 in compensation. British Airways ranks 7th in our AirHelp Score for Airports, a comparison of over 80 airports across the world. According to reports, for the British Airways strike in July, it is unlikely that a pre-planned strike by the airline’s own staff would be deemed an ‘extraordinary circumstance’. This means that passengers whose flights are disrupted could be entitled to money under the European Commission Flight Compensation Regulation EC261, and should file compensation claims. Anyone whose holiday or travel plans have been disrupted could be entitled to up to £530. Please save the checklist below to your phone to share with your fellow travellers and follow @theAirHelper on Twitter for live updates. What’s the reason for the British Airways strike? Dozens of flights, and thousands of passengers, will be affected during the 16 day strike carried out by the British Airways cabin crew between July 1st and July 16th. This latest BA strike is part of a long-running pay dispute involving the Mixed Fleet staff, which comprises of around 35% of BA’s overall airline staff. The strike predominantly affects long-haul flights, with many cancellations of departures leaving from, and arriving to, Heathrow. However, most flights will operate as normal. BA have confirmed that short-haul flights should not be affected. In recent developments, BA have sought permission from the Civil Aviation Authority to bring in nine fully crewed aircraft from its part owner, Qatar Airways. Qatar Airways is the 3rd best airline in the world according to the AirHelp Score for Airlines. The Doha-based airline ranks behind Singapore Airlines and Etihad Airways in our ranking of almost 90 airports worldwide. BA strike: what is an ‘extraordinary circumstance’? This is a tricky question, but we’re glad you asked. Airport strikes — by air traffic controllers or airport staff — are usually deemed ‘extraordinary circumstances’. Other examples include acts of terrorism or sabotage, extreme weather conditions, political unrest, security risks and hidden manufacturing defects. Industrial action, which is strikes by staff unrelated to the airline such as baggage handlers and air traffic controllers, are also deemed ‘extraordinary circumstances’. In all of these instances, the airline isn’t liable for any flight disruptions that occur as a result, as they are circumstances that are out of the airline’s control. In short, the airline can’t prevent them from happening. So passengers are unable to claim for compensation under EU regulation E261. During the British Airways strikes in July, passengers who experience delays and cancellations should be able to claim compensation. However, in cases of industrial action (as outlined above) getting money back from the airline can be less likely. Whenever your journey hits a standstill, it’s always a good idea to check your eligibility anyway. Hey, It’s worth a try, you could be owed cash. When it comes to travel troubles, the best advice we can give is that you know your air passenger rights. This way, you’ll be well prepared for when your journey hits any speed bumps. Here’s our man Scott walking you through all the basics of flight delays and cancellations. Flight delays, cancellations and missed connections happen, but that doesn’t mean you have to accept them. You may be entitled to as much as €600 in compensation if you’ve experienced air travel disruption the last five years.